WIG & PEN:Excursions in Lateral Thinking from Amherst,Massachusetts and the Pioneer Valley: Zero-Risk ATM Winnings: Are they Training Wheels for Slots? Zero-Risk ATM Winnings: Are they Training Wheels for Slots? 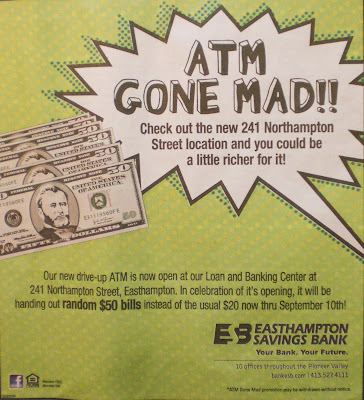 According to the above display ad, which ran in the August 28 Daily Hampshire Gazette, the bank’s new ATM at its Loan & Banking Center on Northampton Street in Easthampton will be dealing occasional fifties in place of twenties through September 10th. In other words, you might experience the frisson of unexpected winnings without the downside of personal risk. And don't forget, any shekels that you put into the ATM are FDIC-secure. But the current value proposition isn't about deposits, it's about withdrawals. 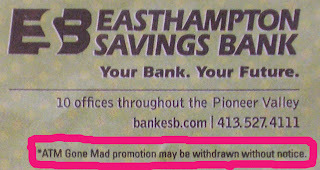 In that spirit, who would spite Easthampton Savings Bank for the disclaimer below?